Digital marketing has become a necessity for any business or organization looking to connect with people online. 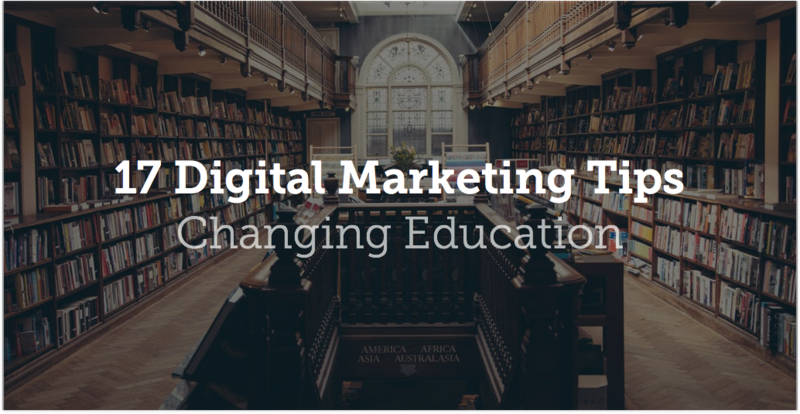 Educational institutions are certainly no different, and those taking the initiative to implement digital marketing strategies are reaping the benefits. At MWI, we’ve had the opportunity to work with a handful of educational institutions in developing successful online strategies that reach their specific audience. Whether its building custom websites, creating content, developing search engine optimization (SEO) strategies, or managing paid advertising campaigns, we love working in this space. So, we’ve assembled a list of quotes giving advice to others in the industry. The following tips are from educators, administrators, marketers, entrepreneurs and thought leaders in the realm of education who have experienced the impact of digital marketing first hand. Hopefully, as you read through these insights you will find some ideas that will fit well with your organization and better enhance your digital marketing. From experience, we know the right digital strategy is crucial to reaching your goals, and furthering your mission. I’ve provided links to the individuals and their associated institutions so you can easily connect. As always, MWI is here to help and you can reach me at adam@mwi.com or fill our a form HERE. I head up all of our partnerships and would be happy to get you set up with our strategist for a free consultation. Happy reading! In today’s marketing world we see a plethora of information about Search Engine Optimization in order to rank within search engines (particularly Google). This information can often seem daunting, ever changing, and time consuming. But one thing remains constant. Search engines work, update, and change to provide their customers (searchers) with the best product (results). So what does that mean for us? It means that great content is Still King. If you have one area of your digital presence that you can dedicate time and resources to- killer content is the place to invest. Great content that is relevant to your audience provides options for search engines when keywords are queried. It helps to set you up as an expert in the field and a thought leader. It contributes to other SEO factors. But most importantly it really gives your customers and potential customers a great experience on your site. Creating content specifically for your target audience(s) is the best way to optimize your resources while educating your viewers. Don’t put all your eggs in the digital marketing basket. Multi-modal is your friend as you think through all of your messages and which delivery mechanism makes the most sense. Getting attention is one thing, but driving to your desired result will demand a more nuanced approach. When it comes to creating dynamic content that’s worthy of a share, do these three things: Be brief. Be relevant. Be real. When your message is shareable, others will advocate for your brand. It’s the social and digital media holy grail. Your website: All organizations need valuable content on their site, and should include the following: FAQ or answers to fundamental questions, storytelling in blog posts and video (this should be a mix of current and alumni stories), virtual tours, a place for alumni to shine, and information regarding important dates. The site should be user-friendly for both prospective students and parents. Research and implement SEO strategies. Also, remember that higher education is an international marketplace and students are researching around the clock. Keep translation in mind as you build. Content: Know your market. Be sure to provide information for parents and students respectively. Students want to know about college lifestyle, environment, classes, and expectations. Parents may want to know more about financial information, scholarships, career placement, etc. Most importantly, your college or university must be a “good fit,” for the student. Display enough information, so a student gets a good feel for your offerings and makes the right decision. Promotion: Use social media to showcase your university or college. Research the most effective campaigns and choose platforms accordingly. For example, you will find more students on sites like Snapchat, while more parents may be on Facebook. Once you’ve determined the right platforms, begin sharing and remember to personalize as much as possible. Be authentic in your reach. Students love images and videos about college life, sports, activities, classes and more. Parents may be interested in different areas such as ROI, financial aid, career placement, and tuition. Use “post-click” personalization email responses: Many universities use Constituent Relationship Management technology to send personal communication to prospective students with inquiries. Given the use of analytics and vast amounts of access to information, schools should be as personal as possible when responding to questions. Stay up-to-date and move quickly: Technology changes and moves quickly. Be sure to follow all industry trends and have professionals on your team who know how to pivot campaigns, strategies, and initiatives quickly. Current high school students appear to prefer Snapchat and YouTube. If a college had students sharing Snapchat stories and YouTube videos with prospective students that would impact their decisions about where to attend. When marketing for a career education college, the primary goal is to know your demographic and where they come from. Targeting those with a sincere interest in allied health careers is priority. As marketing strategies are ever changing with social media and traditional methods, its important to keep up with the best trends to reach your potential students. This requires keeping your finger on the pulse of what is generating interest from your current students in order to reach the new ones. Trends in advertising may change but the need for skilled professionals has not, many potential students do their own research to find the college to begin their career path. Marketing in higher education to me is about connecting moments into as clear a journey as possible for your audiences. For prospective students and parents they need to visualize what this journey will be like for them. For current students, faculty and staff they are in the journey and need to have excellent daily experiences that help them find their way through it. For alumni they need to remember how the journey your institution enabled got them to where they are today. For friends and external community members they need to see how the journey you are providing benefits the state, country, world. This is a continuous process that must be built as an interconnected ecosystem and delivered with intent to provide audience based value that is driven by the institution’s strategy and values. Inconsistencies are the biggest minefield for higher ed marketing and with the complexities of higher ed institutions they can happen frequently when unconnected solutions are delivered outside of this approach. So, have fun with the shiny objects but do so while also building a strong foundation. If one considers that for any marketing to be effective, it needs to add value and be helpful to the consumer, then higher education has such a wonderful opportunity – even an advantage – when it comes to digital marketing. That’s because the nature of the product itself is helpful; the job of understanding how to add value in marketing efforts is solved: educate. Education is transformative. It leaves an individual changed. Market this transformation; tell stories that let the consumers imagination be evoked with the idea that the solution they’re looking for is right in front of them. As a young “millennial” (gosh I hate being called that) who’s recently gone to college, I can tell you exactly what Universities should do: SMS. No joke! The reason I chose the University I did was because my admissions counselor (and some of the other admissions counselors well) texted me to check up on me, and to offer help! 1. Creating value (cliche, but true) and developing a personal relationship. Create REAL value for me in your marketing materials, not just stuff I can google quickly. 2. Develop a personal relationship with me in a way that seems like you’re taking time out of your day to get to know who I am and what I’m about. Having an active social media presence is important, but your website is the medium that you control most. Rethink parts of your website that your target audience simply aren’t interested in, get rid of extraneous content on your website, do usability testing with real users of your website, and enhance search engine optimization. Be real. Be brief. Be relevant. In higher education marketing, we’re asking our target audience to give us something very valuable and very limited — their attention. The generations we’re marketing to are very motive aware and are savvy to traditional marketing tactics. They know when they’re being sold. Millennials and Gen Z want an authentic, realistic digital portrayal of campus life and the community they could be joining. They want to see campus life through the eyes of their peers, because they have low levels of trust for institutions. Create a school hashtag & promote use. Ask all to contribute content. Promote school social sites w/ traditional media/marketing. Use social to drive traffic to your school website. Share behind the scene stories & solutions/answers to FAQ. Get a video together of past and current students to share their experiences – video is big for the future of digital marketing, having real life people sharing their experiences will invoke trust with potential students also. Leverage your professors as digital storytellers. Students are future community members, not customers. As a business, and educational institutes biggest digital/social assets are the professors and teachers. I have a college student and two high school students and they all value personal relationships with their professors and really want to know them. They select their teachers in college, so getting into a program or class that they have seen featured on social media drives awareness and a following. From a digital perspective, content will drive the audience and a university is a rich source of original content. Each professor should be required to be featured by the institute and show why a student would want to study with them and show the students what they can learn from them. White papers, blog posts, discussions on twitter, youtube and snapchat. Brand your messages, be consistent, have your message include diversity and inclusion.